(TibetanReview.net, Dec06, 2017) – A group of Tibetans holding their annual winter market to sell warm clothing in the Indian city of Gwalior in the state of Madhya Pradesh have been subjected to harassment by a gang of local Indian business owners and their friends on Dec 1, arrogating to themselves the role of police and taxmen. Calling themselves concerned citizens and customers, the gang has confronted the Tibetans running a small market of just 25 temporary shacks and accused them of not following the necessary laws. And they have suggested that the Tibetans must be using their income against Indian interests later on. 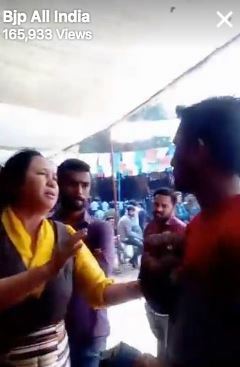 The gang is said to have even posted a video on a Facebook account named ‘Bjp All India’ to make those totally false allegations in an attempt to incite hatred and worse against the hapless smalltime, winter season Tibetan hawkers. For a considerable section of Tibetans living in India, travelling to towns and cities across the country to set up such temporary winter shops remains the main or often only source of livelihood. Their merchandize consists of winter wear items which they source at wholesale rates mainly from the city of Ludhiana in the northern Indian state of Punjab and elsewhere. To the Tibetan shopkeepers in Gwalior, the incident of Dec 1 was nothing more than bullying by disgruntled local business owners and their friends. The Tibetans have said their business was fully legal, right from the stage of paying the GST (Goods and Services Tax) at the time of purchasing their stock, to taking all the necessary permits from the municipal authorities, police and others, and paying the requisite fees for setting up and running the market. Most of such Tibetans lack capital and either take loans from banks and others or buy their merchandize on credit from their suppliers so that any failure of the business result in terrible burden and hardship on them for the rest of the year.